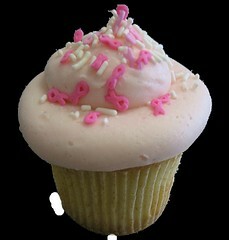 "PInk Ribbon" cupcakes and sprinkle tubes are being sold in both the Burbank and Santa Monica stores for the entire month of May. For each sold, Yummy Cupcakes is donating $.50 cents to the Entertainment Industry Foundation's (EIF) Cancer Research Fund. On May 12th, "Team Yummy Cupcakes" is walking in the EIF Revlon Run/Walk to raise funds and awareness of women's cancers. Everyone is welcome (encouraged) to walk with the team. This team is staff, friends, family and customers. Anyone who wants to join in just needs to call Yummy Cupcakes at either store to register, by May 2nd. It will be a great day for a great cause!